Please Note: The rear sight must be removed to properly mount the included scope. This kit is everything you could ever want from you Dragon Claw! Air Bolts, round balls, and a Mantis 4-12x40 AO scope, what more could you ask for? The Seneca Dragon Claw throws a .50-caliber projectile and gets 230 ft-lbs. of muzzle energy, giving you the power to compete with firearms when hunting. 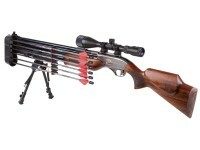 This rifle can humanely and quickly take out feral hogs, javelina, coyote, fox, nutria, possum, woodchuck, raccoon, and similar-sized animals. Because this gun has two large air reservoirs, you have the luxury of getting more shots from a fill and to do more hunting. How many shots will you get from your 500cc Dragon Claw? 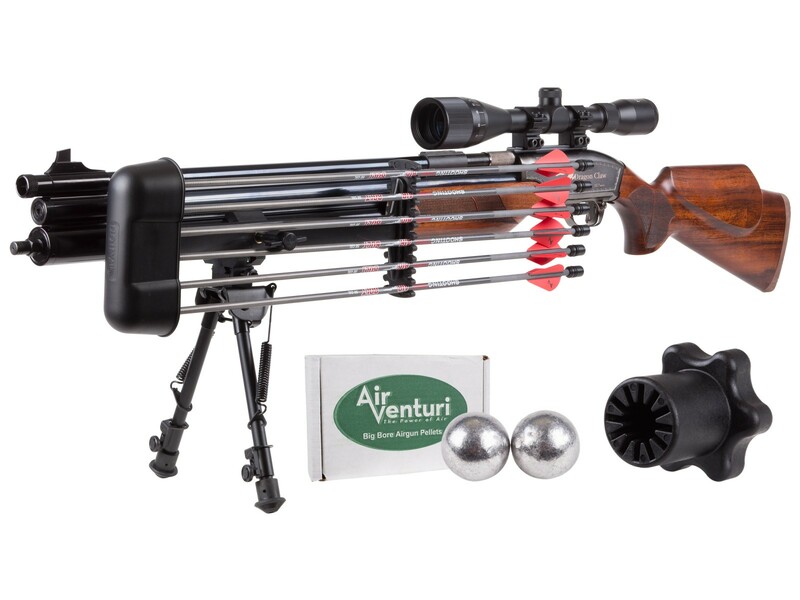 Our tech department filled their dual-tank air rifle to 3,000 psi, loaded it with 210-grain bullets and let loose! They shot the first 4 shots on high power. The first shot was 669 fps. Shot 4 was 681 fps. The next 16 bullets were shot on low power. Shot 5 was 593 fps, and the final shot on low power was 456 fps. That brought the tank down to 800 psi for a total of 20 shots. Things I liked: The look of the weapon. The wood. Things I would have changed: Taller scope rings.I had a modify the front dust cover so that it would fit.Scope is to close to the breach,hard to get open load and close. Better ammunition. Round balls,are you kidding!! What others should know: Very nose heavy!! Balance/center of gravity is bad. Way to expensive for what you get. The Koreans found another dumb American to take advantage of. Fool me once shame on you.Fool me twice shame on me. It won't happen again. I will never buy another weapon that's not American made. Things I liked: Nice looking .50 cal rifle. Ample air storage with two air tanks. Easy to recharge. Different options to choose from for ammo. Things I would have changed: For those of us who cannot afford to pay the full price for the Dragon Claw, we could use the inclusion of some scope mounts. The scope base in the USA is non-standard, and very narrow and short. I wanted control on what I purchased for scope rings, by going to a local dealer. I couldn't physically handle and sort out the merchandise. They didn't have anything. I was not worried about a scope. The other problem is the bolt handle. Received it unattached. Had to be a mechanic to affix the rigid bolt handle. I find the charging handle to be a problem to store and move around the rifle. It creates a problem in a carrying case, because of it's protrusion. It won't be long before the handle punches a hole in the carrier bag. It would be nice if that handle would be a folder when not in use. If the handle folded against the rifle, then when they gun get's shipped, it could be shipped already installed (it punches holes in the shipping box). The convenience would not detract from the beauty. What others should know: I used white nail polish on the back of the front open sight. I couldn't see the front sight, otherwise. I bought a black weaver base, drilled the holes to match the gun's and installed tall standard weaver mount rings, and added a standard scope. My eyes can't see open sights anymore. Using optics on a rifle is not an option for me anymore, it's a necessity. Things I would have changed: As far as the Dragon Claw is considered, there is nothing I would change, other than being able to physically pick out the very one that I purchased from a brick and mortar dealer rather than online. Actually there are more compliments that I could make relative to the Dragon Claw. First, I really like the hardwood stock and forearm (personally, I despise synthetic stocks; I want all of my firearms to have a "pretty piece of wood" as a stock, and my handguns to have genuine stag or ivory stocks/grips, and feel the same way about my airguns); the Dragon Claw is a beautifully manufactured weapon, and every single one that I have seen has been fitted with a beautiful stock and forearm, with precise fitting of the hardwood stock to the gun (I was afraid when I ordered mine online, that it would receive one with an ugly stock and forearm, my main concern to ordering rather than hand-picking the gun from a brick and mortar dealer); however I was very satisfied with my purchase, gorgeous gun. What others should know: The only downfall is if you live in a rural area (as I do), you probably cannot get the gun (or alternatively, a tank) refilled easily without traveling a great distance to a larger city. I quickly recognized this as a problem after purchasing the Dragon Claw, and ended up purchasing an Air Venturi 4500 psi/310 BAR/110 volt electric Air Compressor so that I can refill my gun and shoot whenever I want. This more than doubled the investment in the gun, so finding a place to refill the gun (or alternatively a tank) needs to be considered by anyone who wants to purchase ANY PCP (this is not a unique problem to this great gun. If you want to own a PCP, you will need a reliable source of 3000 PSI air, it's just a fact). Originally I thought that a fire department could fill a tank for me (which would have made my investment significantly lower as a tank is considerably cheaper than the 4500 PSI air compressor), however the local fire department does not have the capability to fill 3000 psi. Is there any suppressors available for this rifle; and, if so, can you still shoot the bolts with the suppressor attached? You can not shoot bolt with a suppressor attached and Pyramydair does not sell them. I Bought the quiver mount for my .50 Cal and the .50 Bolts,but when i inserted the Bolts they just kept falling out.anytime i lifted the Rifle vertical they just slip out they don't seem top be held tight enough.. anyone else having this issue? They can be shot through one, but there is no choke to break them at the end of the barrel. And no, the cylinders are not removable.